mundane jane: To-Do Lists. Yeah, I got 'em. 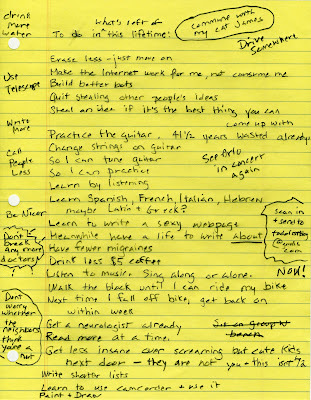 To-Do Lists. Yeah, I got 'em. I'm a huge fan of the to-do list. My life is littered with them. They're tucked into magazines and books, so I know where I was when I gave up ever trying to finish reading that particular publication. There's one on the refrigerator to remind me of the food I need but can never buy because the list is always on the refrigerator. There are always several in the bottom of my purse. I can't find the one stupid dime I need to have enough money to buy a canned Diet Coke, but I can put my hands on a raggedy to-list pretty much any time you care to see one. I've got lists of books to look for the next time I'm at the bookstore or library, and lists of minutia I want to look up the next time I'm unsupervised on the intertubes. I always make a list on Saturday morning to ignore until late Sunday afternoon, and of course, I've got lists of things I have to do at work to make sure somebody rings the bell for me. Most of my lists, though, are for possible future blog posts. Something almost always reminds me that I am out of toilet paper, but I hardly ever remember an idea I've let get away from me. Sasha Cagen's blog is all about lists, and I get lost over there all the time. Lots of people do, and for the longest, I was attributing our fascination to just plain old voyeurism. But if you take a minute to think about it, any kind of to-do list carries with it an implied hope--faith that any amount of crap can be accomplished, once organized properly. And for that, you gotta have a list.